A list of some references proving Baptism was changed by the Catholic church from what Jesus taught and the Apostles practiced. BRITANNICA ENCYCLOPEDIA 11TH edition, Vol 3, Pg 365-366 The baptismal formula was changed from the name of JESUS CHRIST to the words Father, Son, & Holy Ghost by the Catholic Church in the second century. BRITANNICA ENCYCLOPEDIA Vol 3, Pg 82 Everywhere in the oldest sources it states that baptism took place in the name of Jesus Christ. CANNEY ENCYCLOPEDIA OF RELIGION Pg 53 The early church always baptized in the name of the Lord Jesus until development of Trinity doctrine in the 2nd century. 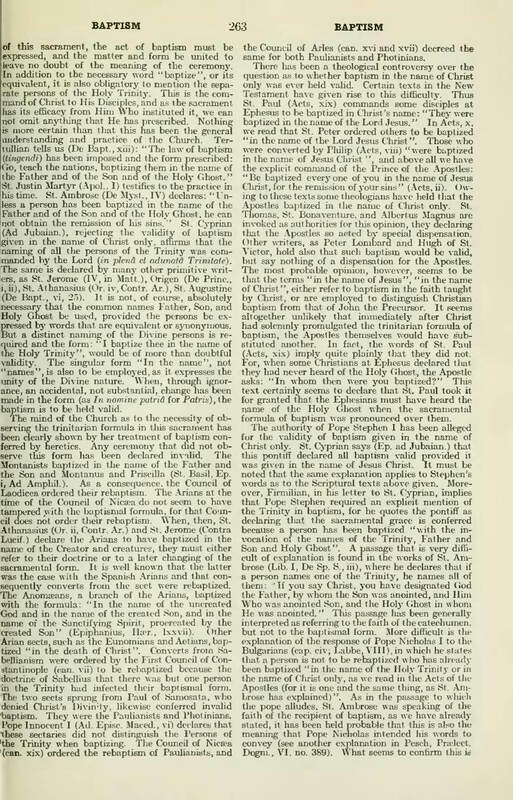 CATHOLIC ENCYCLOPEDIA Vol 2, Pg 263 Here the Catholics acknowledged that baptism was changed by the Catholic Church. HASTINGS ENCYCLOPEDIA OF RELIGION Vol 2, Pg 377 Christian baptism was administered using the words “In the name of Jesus”. Vol 2, Pg 378 The use of a Trinitarian formula of any sort was not suggested in early Church history. Vol 2, Pg 389 Baptism was always in the name of Lord Jesus until the time of Justin Martyr when Triune formula was used. CATHOLIC ENCYCLOPEDIA Vol 8 Justin Martyr was one of the early Fathers of the Roman Catholic Church. NEW INTERNATIONAL ENCYCLOPEDIA Vol 22, Pg 477 The term “Trinity” was originated by Tertullian, a Roman Catholic Church Father. INTERPRETERS DICTIONARY OF THE BIBLE (1962) I, 351 The evidence … suggests that baptism in early Christianity was administered, not in the threefold name, but ‘in the name of the Lord Jesus’. A HISTORY OF CHRISTIAN THOUGHT (Otto Heick) (1965), I, 53 At first baptism was administered in the name of Jesus, but gradually in the name of the Triune God: Father, Son, and Holy Ghost. HASTINGS DICTIONARY OF THE BIBLE (1898), I, 241 [One explanation is that] the original form of words was ‘into the name of Jesus Christ’. Baptism into the name of the Trinity was a later development. A HISTORY OF THE CHRISTIAN CHURCH Williston Walker, (1947), Pg 58 The Trinitarian baptismal formula … was displacing the older baptism in the name of Christ. THE NEW SCHAFF-HERZOG ENCYCLOPEDIA OF RELIGIOUS KNOWLEDGE (1957), I, 435 The New Testament knows only baptism in the name of Jesus …, which still occurs even in the second and third centuries. CANNEY’S ENCYCLOPEDIA OF RELIGIONS (1970), Pg 53 Persons were baptized at first ‘in the name of Jesus Christ’ … or ‘in the name of the Lord Jesus.’… Afterwards, with the development of the doctrine of the Trinity, they were baptized ‘in the name of the Father and of the Son and of the Holy Ghost. ENCYCLOPEDIA BIBLICA (1899), I, 473 It is natural to conclude that baptism was administered in the earliest times ‘in the name of Jesus Christ,’ or in that ‘of the Lord Jesus.’ This view is confirmed by the fact that the earliest forms of the baptismal confession appear to have been single – not triple, as was the later creed. ENCYCLOPEDIA BRITANNICA 11TH edition, (1910), Vol 2, Pg 365 The Trinitarian formula and trine immersion were not uniformly used from the beginning… Bapti[sm] into the name of the Lord [was] the normal formula of the new Testament. In the 3rd century baptism in the name of Christ was still so wide spread that Pope Stephen, in opposition to Cyprian of Carthage, declared it to be valid. The evidence is overwhelming. Baptising in the name of Jesus is obviously the way the apostles baptized in the first Church.